We can think of more than a few elementary school teachers who were probably robots, but who stubbornly insisted on their humanity. Students in South Korea can stop wondering whether their English teachers are humans or robots (or aliens) because the egg-shaped, meter-high creatures are clearly electronic in origin. EngKey (short for “English jockey,” as in disc jockey) is a teaching robot that relays lessons from English teachers in the Philippines to students in 21 South Korean schools. According to South Korean education officials, shy students may feel more confident talking to a robot than to a human teacher, giving them a more positive learning experience overall. 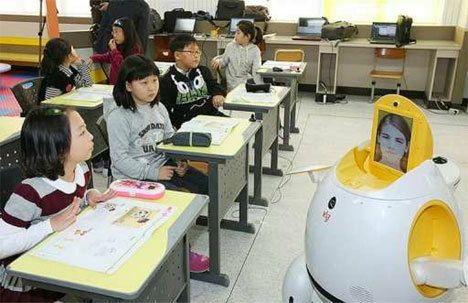 Giving control of the classroom aides to Filipino teachers is less expensive than actually employing teachers to work at the schools, according to scientists at the Korea Institute of Science and Technology where the robots were developed. The teachers controlling the bots can see and hear the students in the classrooms, while cameras trained on the teachers’ faces capture their own expressions which are then reflected on the Caucasian avatar atop the EngKey body. In addition to conversing with students in English, the robots can sing, dance and read books with the class. But they aren’t meant to replace human teachers altogether – they are intended to provide support to the regular teaching staff while engaging students on a whole new level. See more in Robotics or under Technology. December, 2010.